eLearning is more popular today than ever before. In fact, it's been estimated that around half of all college courses will include eLearning by 2019. In addition 41.7% of global Fortune 500 companies now use some form of learning technology to instruct employees during formal earning hours. As such, it's important to have a firm grasp on basics of instructional design, so that you are able to create eLearning courses that provide the best possible educational experience for the learner. 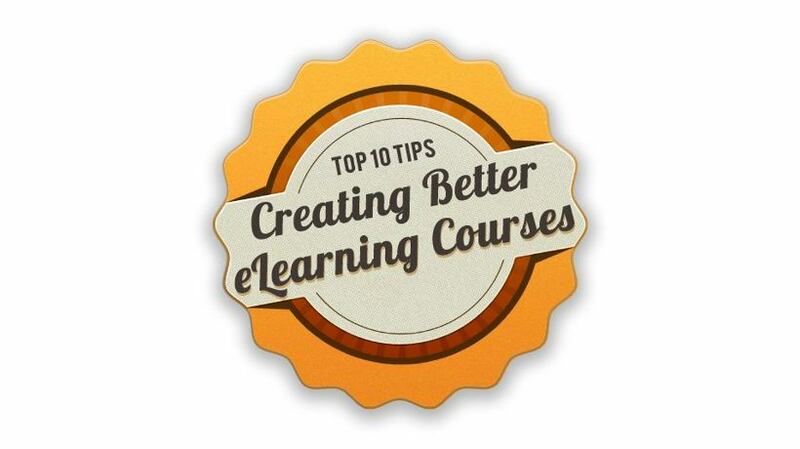 Here are the top 10 tips for creating awesome eLearning courses that are effective, engaging, and immersive. Before you even begin the actual eLearning designing process, you'll want to have a clear idea of how you’d go about converting your face-to-face course to an eLearning format. You need to identify the eLearning course format, the Instructional Design Model that you are going to use, the type(s) of eLearning interaction(s), and last, you have to choose the right learning technology. I highly encourage you read the following article that talks about the TOP 5 tips to convert your traditional course into an eLearning format. In addition to the above, are you planning on delivering the information in a linear format, wherein the learner will receive the data in a particular sequence? Or are you going to give the learner the ability to pick and choose their lesson module during each session? You may find valuable The Concept of Individualized Learning Plans in eLearning article. Make no mistake about it, content is king when it comes to creating a great eLearning experience for your learners. All of the content that you include in should add to the value of your eLearning course. It must also be clear, concise, and written in a way that engages the learner. If your dealing with a topic that may not seem all that interesting, find a way to draw in the learner by humanizing the content. For example, if your eLearning course concerns the basics of biology, create content that helps the learner relate to the topics included. Give them real world examples that illustrate human biology, and let them know how the subject ties into their everyday lives. See what guidelines your eLearning content must follow to resonate more with your learners. Create eLearning Content Your Employees Care About. Do not forget that you need to measure the effectiveness of your eLearning content. To do show, I highly encourage you to read the 5 Tips To Measure eLearning Content Effectiveness. Your eLearning course should include a variety of visual design elements that attract the learner and keep them aesthetically engaged. Include a variety of different multimedia tools, such as pictures and videos, and focus on the overall design of your eLearning course. (To learn about videos in eLearning you may want to read The top 10 tips to effectively using video in your eLearning course). With that being said, an eye-catching design should not come at the price of poor navigation. In essence, your eLearning course shouldn't contain so many graphics and images that it prevents the learner from easily navigating to subsequent eLearning modules. Last but not least, for some reason when I am talking about visual design my audiences' minds goes to learning styles. Be careful when you are talking about learning styles. Check The Myth of Learning Styles and you will find out why. Include models, lessons, or exercises that allow the learner to put their newfound knowledge or skill sets to good use. Integrate activities into the eLearning course that enable the learner to try out the information you've provided, so that they can more effectively retain what they have just acquired. Keep maintenance in mind when designing your eLearning course. Chances are, you're going to revise your eLearning course based on your learners’ constructive feedback, and add new eLearning modules or lessons to the eLearning course in upcoming months and years. As a result, you'll want to create eLearning templates that you can use over and over. That way, you can revise, edit, and add to the eLearning modules, without having to restructure the entire course. Your course should look and feel cohesive all throughout. It should stick to the same graphic design, and feature the same tone and high quality content in each and every eLearning module. You don't want your eLearning course to feel disjointed. Instead, you want to aim on an eLearning course that is in-line with your branding. Sure, you want to include plenty of invaluable information within your eLearning course. However, you never want it to feel cluttered or chaotic. Only include information and graphic elements that are relevant and necessary, as this will help the learner to stay focus on the task at hand (instead of becoming distracted by all of the virtual clutter). Read the How to Engage Your Learners Without Annoying Them article to find out more about the top 5 ways to engage the learner without annoying them (distracting design elements is just one of the many tips featured on the list). You should ALWAYS have some kind of support system in place built into the eLearning course, wherein the learner can receive help if they need it along the way. Live chat, email, and phone are all great support services that you can offer. Even an FAQ can help the learner to feel as though there is a support system in place, which can lead to a more effective learning experience. Want to know more about becoming an eLearning Professional? Click How to Become an eLearning Professional. The Free eLearning professionals' ebook features current eLearning tips, secret concepts, and insider information from 23 of the industry's leading experts, all of which will help you to become a successful eLearning professional. Almost I forgot to mention the ultimate source for Free eLearning Resources! At the Over 1000 Free eLearning Resources you will find from 15 Free eLearning Authoring Tools, 17 Open Source LMSs, and 72 free elearning storyboard templates, to 259 free educational technology tools.